As discussed in our ENTP personality profile, ENTPs are among the most versatile, open, adaptable of all types, displaying a broad array of interests and activities. Because of their openness and versatility, they can find love and compatibility with a number of different personality types. In this post, we will explore numerous dimensions of ENTP relationships. We will begin with an analysis of what ENTPs seek in relationships according to their functional stack. This will be followed by a discussion of their prospective compatibility with various personality types as well as a look at some of the common challenges of ENTP relationships. What Do ENTPs Seek in Love & Relationships? ENTPs dominant function is Extraverted Intuition (Ne), which is the function primarily responsible for their adaptability, versatility, and ideational creativity. So when we ask what ENTPs seek in a relationship, we are in many ways asking what Ne seeks in a relationship. As an extraverted function, Ne is concerned with a breadth of ideas and possibilities in the outside world. ENTPs love speculating and debating, dealing largely in hypotheticals. They enjoy bouncing from one topic to the next, as one idea quickly begets associations with another. Therefore, among ENTPs’ top criteria for compatibility is a partner who is interested in discussing ideas, even those that many consider taboo or subversive. As dominant Perceivers, ENTPs love taking in the world. Most enjoy games, movies, the arts and culture, as well as various outdoor activities. Consequently, ENTPs also seek a partner who is flexible and willing to join them in a breadth of activities. They want a mate who brings a curious attitude to life and isn’t afraid to explore new experiences, options, and ideas. Because of their Ne-Ti combination, ENTPs, like their INTP counterparts, also desire a great deal of freedom and autonomy in their relationships. While men are notorious for not wanting to be “tied down” in a relationship, this is especially true for ENTPs. They crave the space and freedom to openly explore and experiment, and to do it in their own way (Ti). At this point, I want to pause to point out that authentic love, for any Thinking type, has little to do with feelings or infatuation. Rather, healthy and authentic relationships for Thinkers are based on T things (as well as N things in the case of ENTPs) rather than on F matters. And this is exactly where many Thinkers get tripped up. Having assimilated cultural ideals promulgated by Fi romantics, they commonly judge a partner by the degree to which she inspires feelings of love or infatuation. But because Thinkers’ Feeling function is largely unconscious and undeveloped, selecting a long-term partner by way of feelings is in many ways a blind, naïve, and irrational practice. This ties into much of what I have written about the allure of the inferior function, in which Thinkers are drawn to Feelers for the same reasons they fall into the grip of their own inferior (and/or tertiary) function. This is not to say that Thinkers should never pair with Feelers, but only that their relationships are best built on something more substantive than the primal attraction of opposites. Extraverted Feeling (Fe) is ENTPs’ tertiary function. This function contributes an enjoyment of being around people. However, in light of our above discussion, ENTPs authentically need people and relationships more for the sake of Ne dialogue than for Fe reciprocation of feelings. The last of ENTPs’ functions is Introverted Sensing (Si), which serves as their inferior function. Despite its inferior position, ENTPs must reckon with their Si on a regular basis. As the functional opposite of Ne, Si urges them to forego the new (Ne) in favor of the tried and true (Si). It confers a concern for tradition, as well as for the development of behavioral routines and habits. This often leads ENTPs to feel torn between future possibilities (Ne) and past precedent (Si), between novelty and stability (see my ENTP profile for more on this Ne-Si tug-of-war). Because of their Si, ENTPs may at times end up pairing with SJ types, especially ISFJs or ESFJs, who serve as embodiments of ENTPs’ less conscious self. They may find themselves comforted by SJs’ air of confidence, stability, and reliability. Such relationships can provide ENTPs with what appears to be a fast track to wholeness. Unfortunately, it is rarely long before such pairings begin to encounter difficulties, as they realize how little they have in common and how different they really are. This is not to say that ENTPs could never make it work with SJs, but only that these relationships are predictably more challenging because of the opposing nature of the involved personality functions. 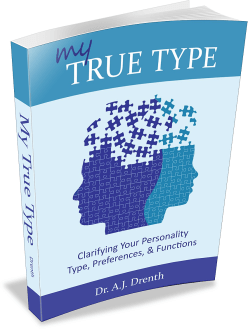 It is also not uncommon for ENTPs to pair with SP types (i.e., ESTPs, ESFPs, ISTPs, ISFPs). This is due, at least in part, to the fact that SPs are extremely common, especially in the U.S. With regard to compatibility, SPs are not predicted to be significantly better matches for ENTPs than SJs are. Of the SPs types, ENTPs may do better with ESPs than ISPs. ESPs, who are also Perceiving dominants, can resemble ENTPs in their tendency to be fun-loving and novelty-seeking (this similarity is evidenced, for instance, in the conflation of Se and Ne in the Enneagram type 7). These types may share interests in things like games and movies, as well as various physical activities. However, unlike ENTPs, ESPs are the most concrete of all the types, shying away from abstract discussions. ENTPs and ESPs also tend to have disparate lifestyle preferences, with ESPs displaying a greater concern for social status and material novelty. ENTPs, by contrast, are relatively unconcerned with material novelties and niceties, placing higher priority on creative and ideational treasures. As you may have already guessed, ENTPs are likely to enjoy greater compatibility with N types than S types. Those pairing another NP type (e.g., INTPs, ENFPs, INFPs) can enjoy a partner with a similar attitude of openness and curiosity toward life. This is particularly true when pairing with ENFPs or another ENTP. With that said, ENP-ENP couples may run into difficulties related to excessive similarity or a deficiency of complementarity. They may find, for instance, that both partners prefer to be talking most of the time, making conversations more competitive or frustrating than nourishing. Therefore, ENTPs may find easier compatibility with the INFP or INTP types, who are more naturally inclined to listen or ask questions. ENTPs can also enjoy easy compatibility in lifestyle with other NP types. Many NPs (especially those not raised in affluence) display relatively meager standards of living. Using Si rather than Se, they tend to be minimalists with respect to the material world (this seems particularly true of INPs). Hence, finances may be less of a contentious issue in NP-NP pairings. Finally, ENTPs may also pair quite well with NJ types. Since INJs are also dominant Perceivers (i.e., preferring Ni), they generally share ENPs’ attitude of openness, even if this is largely concealed behind the veil of introversion. ENTPs can enjoy much as far as intellectual and philosophical discussion, as well as the arts and culture, with both INTJs and INFJs. With that said, INFJs, who share the ENTP’s Fe-Ti function pair, are likely to be a better (or at least a more natural) match than INTJs. 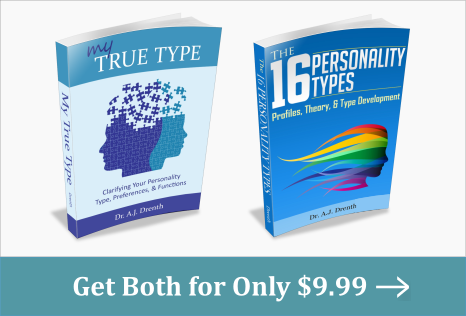 Sharing the Fe-Ti function pair contributes a similarity of interests, epistemology, and communication styles, all of which bode well for the ENTP-INFJ pairing. ENFJs, who also use Fe-Ti, may also be an excellent match for ENTPs. Since ENFJs are among the most talkative of all types, the ENTP will likely use Ne more for listening than expressing when paired with an ENFJ. One foreseeable difficulty in this pairing could involve the ENFJ trying to change or motivate the ENTP to be someone he is not. This could inspire fierce resistance from the highly independent ENTP, even if displayed in passive-aggressive ways. ENTP-ENTJ pairings are fairly uncommon, since these types typically have little as far as upfront chemistry. They also have no functions in common and may display significantly different interests and approaches to life. This is not to say that such a pairing could never work (or even work well), but both partners would need to be quite individuated and secure in themselves. Like other P-types, ENTPs can be prone to mistaking relational harmony for relational health. Since their natural mode is one of adaptation, they may assume they can adapt their way out of nearly any relational difficulty. While some degree of compromise is helpful and necessary in any relationship, some ENTPs may do so excessively. This tendency relates not only to their status as P-types, but to their tertiary Fe, which strives to maintain peace and harmony in relationships. Consequently, ENTPs can end up digging themselves a relational hole by adapting to the point of losing themselves. This can lead them to resent their partner and act out in passive-aggressive ways. It is therefore important for ENTPs to adopt a policy of openness and honesty in their relationships, ensuring that their grievances and preferences are being openly aired and discussed. With that said, the foremost challenge for ENTPs is often not their relationships, but finding a suitable and satisfying career. As discussed on our ENTP careers page, ENTPs commonly struggle to find consistently satisfying work. This struggle inevitably impacts their relationships, especially when others are financially dependent on them. Many ENTPs find themselves stuck in a situation of working a less than optimal job for the sake of making ends meet, and there is nothing worse for an ENTP than feeling trapped. For this reason, ENTPs may be wise to focus on fashioning a favorable work situation prior to committing to a long-term relationship.